Although not a huge blockbuster hit, this clever CGI film is actually one of the better animated movies in the last few years. 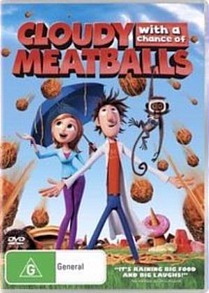 Cloudy with a Chance of Meatballs may sound outrageously juvenile but just because it’s based on the children’s book of the same name by Judi and Ron Barrett, don’t just think it’s a kids movie. Because if offers something for children and adults alike, just like the movie Up. The story follows Flint Lockwood (Bill Hader), an inventor who has a knack of getting both him and his inventions in strife. Of course when something goes wrong, the repercussions generally flow onto the inhabitants of the island of Swallow Falls but this is what the charm of Cloudy with a Chance of Meatballs is all about. For those who live on the island, their life is anything but exciting, especially because their main diet revolves around sardines. This is due to the fact that their sardine industry has collapsed and in order to survive on this island, they must include sardines in everything they eat. Thankfully, Flint and his talking monkey Steve who is voiced brilliantly by Neil Patrick Harris are attempting to create a machine that can turn water into a variety of foods. Of course the machine works and when it rains, Swallow Falls is inundated with all sorts of food from cakes to hotdogs. Joining Flint is Samantha “Sam” Sparks (Anna Faris), a weather girl who is visiting the island to see what all the kerfuffle is about However when the machine goes haywire, Flint is turned from hero to zero, until his assorted of colourful friends can rectify the problem. The movie is quite “light” in terms of plot but the characters are very likeable and the film involves, comedy, drama, action and a touch of romance that truly made this a pleasant and memorable experience. On the DVD, the movie looks brilliant with bright colours, sharp images and animation to die for. Add in Dolby Digital 5.1 and this is as cinematic as movies come and certain scenes in the movie BOOM through our surround sound system. Thankfully all the dialogue is perfect in terms of sound effects and music, so there’s no need to keep adjusting your volume.